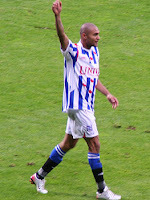 Manchester City are expected to complete a deal for Heerenveen striker Afonso Alves over the weekend, with Greek striker Georgios Samaras moving in the opposite direction alongside a cash payment of £14million. Alves, 26, recently scored seven goals in one game against Heracles and has been linked with numerous English and Spanish clubs over the last few months. He has recently broken into the Brazilian national squad and has scored one goal in eight appearances. If a deal is completed, Alves will add some much needed firepower to the City attack in January and will link up with fellow Brazilians Elano and Geovanni at the City of Manchester Stadium.